Is there a better alternative to OPSWAT GEARS? Is OPSWAT GEARS really the best app in Security category? Will OPSWAT GEARS work good on macOS 10.13.4? OPSWAT GEARS needs a review. Be the first to review this app and get the discussion started! OPSWAT GEARS needs a rating. Be the first to rate this app and get the discussion started! 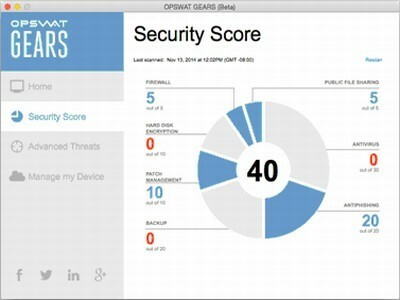 The free OPSWAT GEARS tool allows home users and IT professionals to easily monitor the current state of their device and improve overall device security. Users can monitor their installed security applications and their status, including antivirus, firewall, and hard disk encryption. GEARS also alerts users to potential threats present on their machine that the installed anti-malware software didn't detect or couldn't remediate. Using two methods to detect infected files, GEARS is able to provide a unique take on whether a device is compromised. The application, powered by OPSWAT's Metascan Online service, scans the device with 40+ commercial anti-malware engines and identifies threats that may not have been detected by the user's installed anti-malware software. In addition, by utilizing enhanced pattern-matching capabilities, GEARS researches the history of threats detected by the installed anti-malware software to determine which threats are occurring repeatedly. By thoroughly examining the threat-detection logs, GEARS enables users to be notified of persistent threats on their computer. For users with multiple devices to manage, the GEARS application can be connected to the GEARS cloud management dashboard. This allows both home network owners and IT administrators to easily monitor and manage multiple devices from any browser. By creating an account and managing devices from the cloud, users are also able to take advantage of additional features and configuration options.